How did we go about deciding what needed to be changed? The vast majority of visitors come to the site simply to log in to their accounts. After filtering these visits from our analysis, we looked at conversion rates -- new account sign ups-- and what content people looked at. It was clear that much important content, for example relating to training and professional services, was too buried for people to find. Although some visitors used the search box, we were surprised to find relatively few searches for education and professional services. Our guess is that not enough people know about these services, so we decided to create new sections for this content and address site navigation to make it more intuitive. So, what is the result? Here are a few highlights. The new updated Product area groups key features to help new and prospective users understand how the parts work together and how Google Analytics fits into the larger ecosystem of Google offerings that includes AdWords and Website Optimizer. Considerable resources -- both free and fee-based -- are available to organizations using Google Analytics. The Support section provides a single point of access to these resources ranging from online communities to professional services offered by Authorized Consultant companies. You can quickly search our expanding global network for an Authorized Consultant in your region that specializes in the areas you'd like help with, whether that be installation assistance, consulting, customized training, or Urchin Software. 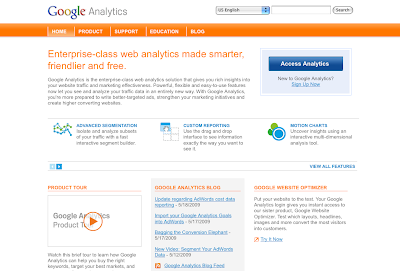 The Education section outlines ongoing opportunities to learn more about how to use Google Analytics more effectively. If you're an individual looking to develop skills for your career or a manager looking for cost effective ways to train your staff, you'll find the latest information you need on the Google Analytics IQ online course and test, Seminars for Success, and helpful videos. Of course, the site won't be static. While we don't want to fall into the trap of trying to test everything, you may notice subtle site changes going forward as we use Website Optimizer to inform ongoing iterative updates. We hope you like the new site and find it useful. Feel free to post a comment and let us know what you think. We'll share what we learn going forward. We're going to be working on the blog design and resources as well over the next couple of weeks. We've given the Google Analytics site a refresh! Drawing upon insights from conversations with the Google Analytics community -- both online and in person, and from looking carefully at our own Analytics reports, we've reorganized the site to do a better job of exposing the information you're looking for. And, we've added a dash of visual style in the process.